Although the terms are sometimes used interchangeably, graduation announcements and graduation invitations are different. A graduation announcement is sent to all relatives and friends of the family to announce the achievement. Once you figure out what to say on graduation announcements, you can have some fun with the actual wording. Whether you're ordering online or making a DIY version, there are some basic pieces of information that make up graduation announcements. Student's and Parents' Names: Formal announcements should include the student's full name along with parents' names. Informal versions can include nicknames rather than a full name. Student's Picture: Most often announcements include either a senior portrait of the graduate or a photo of them in cap and gown at the ceremony. School name: The name of the school the student is graduating from should appear somewhere. Year/date/time: Be sure to include the year and graduation date. It's a good idea to include a phrase like Class of (year). 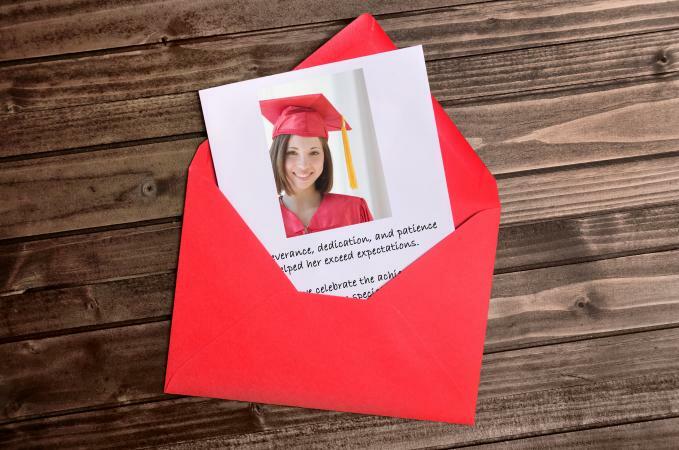 Sending email announcements is still frowned upon by many, so unless the student and recipients are tech savvy and will appreciate a digital graduation announcement, it is best to stick with a mailed card. There are different ways to announce the graduation ceremony. These include everything from a graduation poem to a prayer or a memorable quote. The idea is to share the achievement with details about the student, the graduation ceremony, and future plans. These sample graduation announcements will give you some ideas. "You're off to great places! Today is your day. Your mountain is waiting, so get on your way!" -Dr. Seuss. (Parent Names) are delighted to send (Student Name) out into the world for his next great adventure. Congratulations, (Student First Name), on your graduation from (School Name). After the ceremony, he will leave this great place to discover others throughout Europe. All grown up! (Student Full Name) graduated from (School Name) on (Ceremony Date). She has taken her first steps into the adult world by accepting a full scholarship to (College Name) where she will major in (Major). Perseverance, dedication, and patience helped her exceed expectations. Today we celebrate the achievement with some very special treatment. (Student Full Name), Class of (Year), (School Name) has made us all proud by graduating with honors. I Came, I Learned, I Conquered. (Student First Name, "Nickname," Last Name) is thrilled to announce her graduation from (School Name), Class of (Year). Watch out (College Name), (Student First Name) is on her way! Thank you for being a part of her high school legacy. The greatest gift you can share is your sincere pride and joy! "For I know the plans I have for you', declares the LORD, 'Plans to prosper you and not to harm you, plans to give you hope and a future." -NIV, Jeremiah 29:11 Thank you Lord, family, friends and neighbors for helping our little girl along the journey of high school. It is with great honor we introduce our favorite member of the Class of (Year), (Student Full Name). God is good and has set her on the path toward helping others as she will enter (Occupational Field) school in the fall. In celebration of this momentous occasion, we humbly ask for your congratulations and a promise of continued support and guidance (Student First Name) on her next leg of life's journey. It's a slam dunk for (Student Full Name)! He has won many games throughout his high school career, and now he takes home the ultimate trophy, a high school diploma. Thanks for being on our team all these years. (School Name), Class of (Year) will honor graduates on (Date of Ceremony) at (Location). You don't have to be in the crowd to cheer for (Student First Name), cards are welcome and can be sent to (Student Address). (Student First Name) is undecided which team he'll join next so stay tuned! From infant to toddler, child to teenager, young adult to grown woman, (Student Full Name) has reached many milestones thanks to the teachers, friends, and family members guiding her every step of the way. From high school to (College Name) Class of (Year) and next onto (Graduate/Post-Graduate School), we hope you join us in congratulating (Student First Name) on another milestone and continue to guide her in the years to come. Personalize any sample wording by adding or removing information about your particular situation. If you are unfamiliar with the etiquette for graduation announcements, it may not be clear what to do when the time comes to send them out. No matter the tone or style you choose, there are some standard etiquette practices everyone can follow. Send announcements to friends, neighbors, and family members you would invite to a birthday party, cookout, or another gathering. Announcements can be ordered through school, online, a local print shop, or created on your computer using printable graduation announcement templates. Write out entire words rather than using abbreviations when addressing the announcements. Since you probably won't be able to invite everyone to the graduation ceremony, you can send announcements after the ceremony takes place. If your announcements came with vellum paper, it goes on the inside of the announcement. If there are two envelopes, the one with the glue is the outside envelope. The inner envelope should have the name of the addressee. It is acceptable to be a little informal on the inner envelope, such as writing "Grandma Sarah." However, if you don't know the person well, remain formal and write "Mr. Jones," etc. On the outer envelope, handwrite the person's formal name and address. According to Fox Business, if you are not planning a graduation party, then send the announcements in the days following the graduation ceremony. If you are planning a party, announcements can be sent with invitations three to four weeks before the events. Graduation is an important milestone in a person's life, so send announcements to more people rather than fewer. Graduation is an exciting time in a young person's life. It marks the end of childhood and the beginning of a bright future. Even acquaintances will be happy to hear of the accomplishment. Gifts and cards of congratulations should be addressed to the graduate. 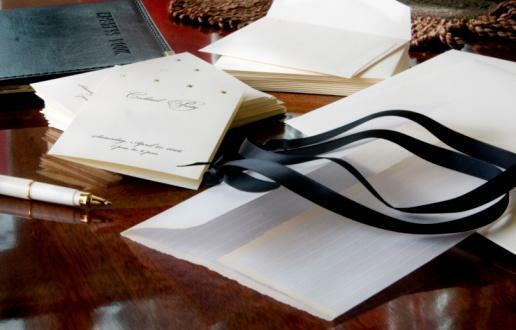 As the graduate, if you are given a gift, be sure to hand write each person a thank-you note promptly. Personalized notes include the specifics of the gift and show professionalism along with maturity. Whether graduating from an elementary level program, high school or college, close friends and family love to be informed of major life accomplishments. One of the best parts about achievement is getting to share your success with others.